I made No-Bake cookies (because I have been craving them since before Thanksgiving), sparkled up the kitchen, drank 3 full glasses of ice water (because my body decided it was delicious) and dreamed about playing life-sized paper dolls with these beautiful fabric dress-up dolls. Paper dolls and Polly Pockets were my faaaaaaaavorite when I was a little one. I'm thinking not much has changed considering how obsessed I am about these fantastic little things. There are also spring, summer, autumn, winter collections. gaaahhhhhhh! Actually anything and everything in her shop is making me drool (did you see the birds in top-hats?!). Geri, put down the mouse and step away from the etsy shop. Alright, going to distract myself by painting my fingernails gold or red or sparkly or something. Have yourself a good Sundee evening! You used to even make your own paper dolls you loved them so much. What a mess maker you were, though. Always a few projects going. ooh thx for the cookie recipe! my goal for the new year is definitely NOT to eat less cookies! okay 2 things. 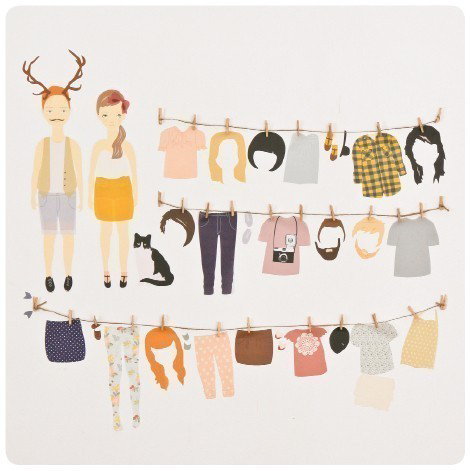 Paper dolls... not gonna lie, sorta creepy at your age. No Bake Cookies... seriously wish I woulda hopped onto your blog Sunday cuz I told Lane while we were doing the norm lounge and eat homemade nachos "I really wish I had a killer no baked cookie recipe cuz they sound delish!" NO LIE! We are sissies fa shizzle!